We write on behalf of the Middle East Studies Association (MESA) of North America and its Committee on Academic Freedom to register our concerns regarding the recent cancellation by the university administration of its contract with Tarek Abol Naga, a professor of architecture, after some art projects for the completion of the Bachelor of Architecture he supervised were deemed “immoral.” The cancellation of a contract for such reasons violates the academic freedom of the GUC faculty as they exercise their autonomous judgment regarding teaching and supervision of student projects. We understand that in July 2016, at the behest of the university administration, members of the university security force tore up the designs of two students who had worked with Tarek Abol Naga on their architecture projects. The designs were removed from the exhibit on campus without consultation of the students, Tarek Abol Naga, or other faculty members, and allegedly as a result of complaints filed by some students’ parents, although no evidence has been produced of such complaints. Tarek Abol Naga’s contract was then ended in August 2016 without apparent justification. Throughout the semester, the dean of the Faculty of Architecture, professor Tamer El Khorazaty, was fully aware of the subjects selected by the students, as he attended several presentations of the architecture projects in progress. The dean, along with two other external examiners, also attended the final examinations and presentations and engaged the students in lengthy discussions, during which none expressed any concern or reservations regarding any of the students’ works. The German University in Cairo is a private university under the supervision of Egypt’s Ministry of Higher Education. It has been funded since 2003 by the German Federal Ministry of Education and Research via the German Academic Exchange Service (DAAD) as well as the German Embassy in Cairo, and the State of Baden-Württemberg, and in addition since 2006 through stipends granted by the German Foreign Office, and cooperation agreements with several German universities. Currently, the GUC has over 10, 000 students studying at both undergraduate and postgraduate level in Cairo and Berlin. Overall, various German public institutions have supported the University since its founding with more than 5 million Euro. Courses at the GUC are integrated with study courses at several German universities, including the universities of Stuttgart, Ulm, and Tübingen, and the rectors of the universities of Stuttgart and Ulm sit on the GUC’s Board of Trustees. In addition to German public institutions, the University has been supported by the private German Donors' Association for the Promotion of Science and Humanities, the German-Arab Chamber of Industry and Commerce, private Egyptian donors, and the considerable tuition fees of ca. 10,000 Euro that students pay per year. As GUC is the largest foreign university funded by German public institutions, Germany has a major stake in the success of the university, which self-identifies as a “Facilitator and Promoter of democratic development in Egypt” (Vermittlerin und Förderin der demokratischen Entwicklung in Ägypten). The recent incidents connected to Tarek Abol Naga and his students come after other disconcerting incidents on campus which cast a grave shadow on the university’s understanding of academic freedom, let alone its proclaimed role as a promoter of democratic development in Egypt. In August 2015, the administration expelled seven students for participating in protests condemning the death of a female student who had been run over by a university bus. After organizing a student protest, the chair of the student administration at the time, Karim Naguib, was suspended for “inciting unrest and upheaval.” In 2012, the administration expelled five students and prevented others from taking their exams because of their participation in vigils to express their opposition to the Supreme Council of the Armed Forces, and in demonstrations to express their desire to change procedures for conducting student union elections. 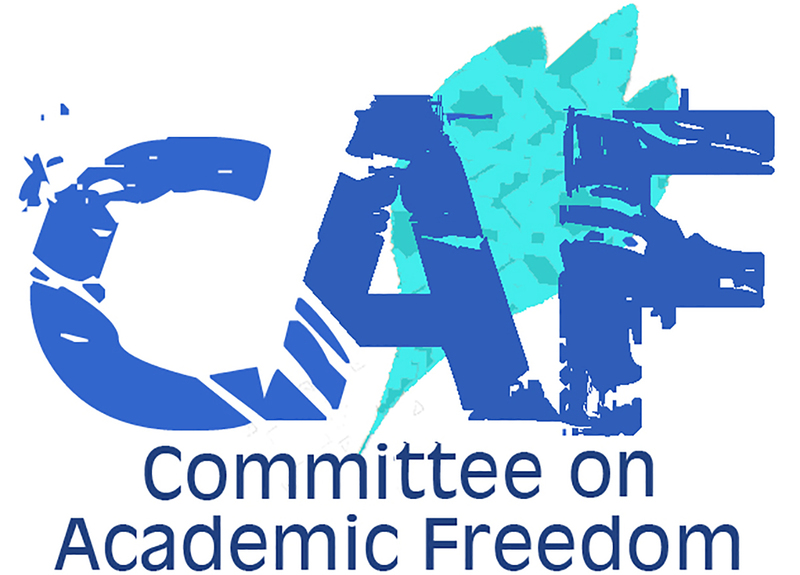 MESA is deeply concerned about the freedom of Egyptian students and professors to express themselves, a freedom which by most accounts has been severely violated since 2013, by such means as restrictions on scientific research, illegitimate cancellations of contracts, the forced suspension and sometimes expulsion of students, and requirements that professors not travel abroad unless they seek the Ministry of Foreign Affairs’ approval and pay a fee. We call upon the president of GUC to reverse the decision to cancel Tarek Abol Naga’s contract, and to compensate the students for their destroyed artwork. We further urge the president and the university to uphold both the rights of faculty to exercise their autonomous judgment regarding teaching and supervision of student projects, and the rights of students to express their views on campus. Only in this way can the highest standards of academic freedom be upheld at the GUC as they are on its partner campuses in Germany, and only in this way can it fulfill its founding mandate of facilitating and promoting democratic development in Egypt. We call upon GUC’s cooperation partners in Germany to use their considerable leverage over the GUC administration in light of the support, in the form of finances, personnel and expertise, that they render to the Cairo-based university to work towards the restoration and protection of academic freedom at the GUC and to otherwise reconsider their partnerships and support to the German University in Cairo. Thank you for your attention to this matter. We await your reply.